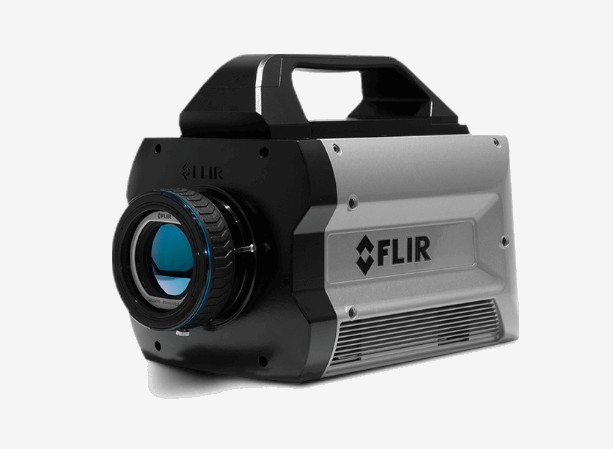 FLIR offers the X8500sc as its new high-sensitivity, high-speed MWIR camera and LWIR camera for science and R&D applications. The X8500sc MWIR features a FLIR indium antimonide (InSb) detector, while the X8500sc SLS LWIR features a strained layer superlattice (SLS) detector. With 1280 x 1024 resolution, fast frame rates, and RAM/SSD recording, this camera allows for full imaging of the scene and stop motion on high speed events both in the lab or on the test range. The cameras have customizable features and full-frame recording to on-camera RAM to allow the user to capture critical data quickly. Playback from the RAM or saving to the removable SSD takes only 90 seconds before the camera is ready to begin a new recording. It also streams high speed 14-bit data simultaneously over Gigabit Ethernet, Camera Link, and CoaXpress for live viewing, analysis, or recording. Visit the X8500sc MWIR and the X8500sc SLS LWIR pages for more information on the individual models. Click here for a side-by-side comparison of the two cameras.